Approval of Minutes: Minutes not available. Skipped. President Comments: Jay bade us farewell as President. Training: Dan proposed that we get back to doing Rescue training. Jenny mentioned that it’s in the pre-planning for next year. Vincent said we have paid $800 to Landmark Learning for Wilderness First Aid that was cancelled and hasn’t been rescheduled. Jenny will follow up on what’s going on with this. Jimmy Jones was handling it. Social Christmas Party – Scheduled for first Saturday in December. Debbie reported venue reserved and paid for. 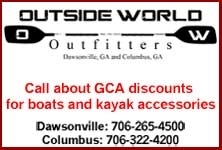 Raffle donations – ACE Kayak has promised $150 certificate for lesson. Jay will donate painting. Jenny will check with Jim Tebbel re who is NRS contact for throwbags. Jenny has Kokatat contact and will also talk to Anna Levesque. Jenny will check with NOC and also call Jennifer Whitlock re jewelry. Jay and Lisa will donate time as trainer. Jenny will talk to Stephen re donating woodwork and Nicole Keating re jewelry. Jay will talk to Cheryl Beverly re jewelry. Lisa will ask SMM re campsite donations but it’s iffy due to change in management. Boat raffle prize – Decision made to offer gift certificate towards purchase of a boat (winner’s choice). Amount is TBD once we know who the offer is from and Vincent reports on what we’ve spent in the past. Note: Todd got last year’s boat for free; other times he bought boats at really good discounts or we won them from the Southeastern race. Todd suggested we ask dealers/outfitters if they’d like to participate and then offer to pay for half. Treasurer: Donations for Olivia – Typically the donation is $250. Board voted to do this. Vincent will mail check to her. Vincent distributed the treasurer’s report. 14 new members, 11 renewals for September. Dan asked if report included PayPal money. PayPal gives us a report of everyone paying in the month. Most came through PayPal rather than PO Box. Jenny asked re postage. $60.53 expenditure not for EddyLine. Some for membership postage, other for miscellaneous admin mailing. PO Box renewed for 6 months. Dan asked if we are looking at CD’s to keep River Access Fund money in. Vincent said he would check into it. Dan recommended Fidelity as having very good rates. Dan requested data re money in/money out for the past year. Club has always tried to break even, roughly but last year, 50th anniversary, we chose to pay for meals and spend more than in prior years at club functions. We spent a bit more ($3,340) than we received in the past 12 months. Vincent will present a detailed accounting of expenditures for 2017 next month. New Business: Roll Practice – Lisa said PC roll practice starting Oct. 22nd. First two sessions are paid for but she will need check next month. Vincent will provide. Jay pointed out the importance of roll practice to the membership. It’s something that social media can’t do for members. Insurance – GCA’s Certificate of Insurance expires December 1st. ACA needs to have a single contact – used to be Betsy. There will only be two roll practices this year but other events may need COI. Vincent asked Lisa if she would agree to be contact for COI’s. Note: Carol Reiser accepted the assignment after the meeting. Lisa mentioned Boys & Girls Club venue has re-opened and suggested we might get practice going there again. Jenny said she’d check on this. Contact’s name in the past was Gail per Vincent. Demo Days – Lisa has been trying to set some up. Pyranha & ERA are scheduled. She is working on Black Fly and The Outside World. She requested we offer a $100 stipend. Board approved these four. Old Business: Club Membership Paddle – Joanne has food order handled; she is keeping head count. NOC not open so self-shuttle proposed and agreed upon. Allen asked re RSVP for pizza order since non-members cannot sign up. Board agreed to addition of note to prospective members asking them to email their intention to attend. This will be done for future events. Also Jenny will add to Facebook. Tallulah – Tammy Lea needs additional volunteers. Laura needs ACA insurance COI; wants to treat it as a paddle club sponsored event. Needs to give to DNR. Vincent thinks the COI will be $25. He will call about that. GCA will provide water and snacks to volunteers. Jenny will handle. Nov. 11th & 12th. Southeastern Races – Oct. 22nd. Todd is handling the event. Debbie suggested that people getting recertified might help. Todd requested that everyone promote the race. We will have medals this year. Todd needs 5 or 6 volunteers. They should contact Todd directly via email. Jenny will pin post to GCA page after membership paddle on Sunday. David Asbell’s wife has volunteered. Motion to Adjourn: Jenny moved to adjourn.